Two-year SARE grant funded the investigation of cost-effectively raising slug-eating ducks in a shiitake mushroom yard. SARE (Sustainable Agriculture Research and Education) offers grants to farmers, educators, universities and communities that are working to make agriculture more sustainable – economically, environmentally, and socially. Learn about whether a SARE grant would be a good fit for you. 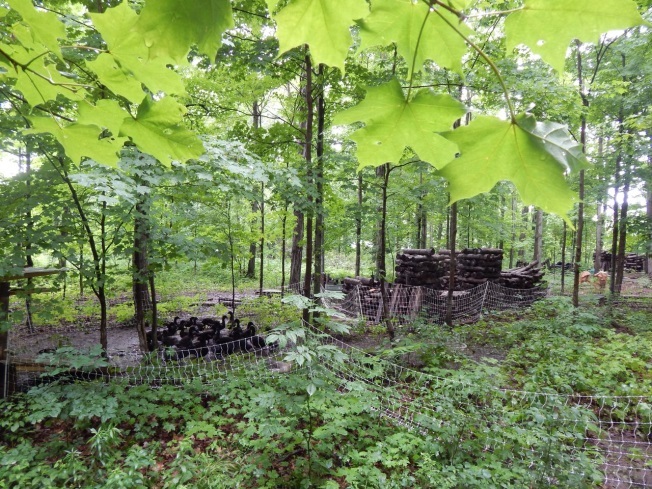 There is a lot to observe in researcher and farmer Steve Gabriel’s woods: sugar maple trees, which he taps for about 20 gallons of syrup in the winter, provide the necessary shade for his 500-log shiitake mushroom yard. The mushroom logs are surrounded by a flock of glossy black Cayuga ducks, who feed on the slugs that damage fruiting shiitakes. Forest forages provide a low-cost duck feed in addition to traditional sources. 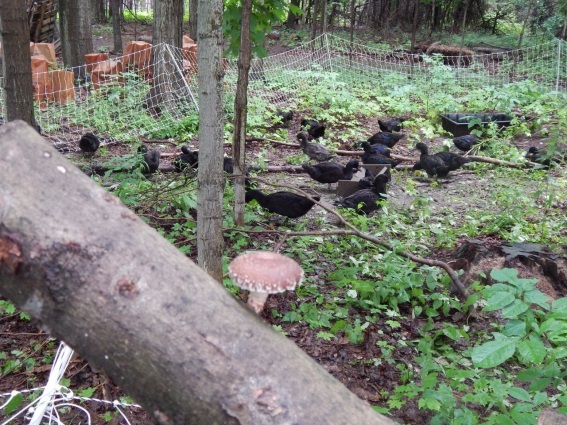 Gabriel received SARE funding to test the integration of ducks into his mushroom yard for two main reasons: 1) ducks eat slugs, the main pest of shiitake mushrooms and 2) local, free-range ducks are a specialty meat in demand by high-end restaurants; eggs and breeding ducks are in demand by local consumers and farmers. Gabriel practices “forest farming” or “agroforestry,” which to him means growing crops underneath the canopy of an existing forest and integrating livestock. Ducks keep his shiitake mushrooms healthy by eating damage-causing slug pests, forest forages supplement duck feed, and duck manure helps regulate soil quality for sugar maples. Each element is a part of Gabriel’s cohesive system of “self-perpetuating solutions,” as he calls them. In 2003, when he started growing shiitakes, Gabriel immediately noticed slug damage on his mushrooms. He framed the issue differently than the average farmer might. There was simply a missing link in the system. “Rather than having a slug problem,” he explained, “I was having a duck deficiency.” This is a philosophy largely credited to Permaculture co-founder Bill Mollison. In this two-year project, SARE funding allowed Gabriel to increase the size of his flock from just six ducks to seventy. The money was spent on building materials for the duck houses, fencing, feed, and research labor time. Three quarter-acre test plots held about 120 logs each. A duck house with rainwater catchment for watering served the two test plots, with one being a control having no duck activity during the growing season. The two years of the project contained two very different growing seasons, 2012 being hot and dry and 2013 being hot and wet. In 2012, drought conditions led to relatively low slug populations, so Gabriel had more time to focus on familiarizing himself with duck breed and behavior. In the first year of research, ducks were raised for meat, so breed was of particular importance. One test plot housed 10 Rouen and 15 Muscovy ducks, plus 1 Chinese goose to fend off forest predators. The other test plot consisted of 10 Cayuga and 10 Swedish Blue ducks, plus 1 African Goose. These breeds were chosen for their meat quality and forage tendencies. After slaughter each of the breeds was taste-tested by local chefs, extension agents, farmers, and consumers. Tasters gave Muscovy poor reviews, largely preferring the heritage breeds Rouen, Cayuga, and Swedish Blue. 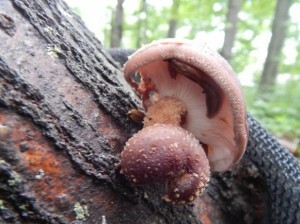 Slugs feed on mushrooms and damage logs. While consumers had the opportunity to taste duck meat post-season, during the first growing season some ducks held a tasting of their own—on the mushrooms they were supposed to be protecting from slug damage. These ducks took a liking to Gabriel’s gourmet shiitakes and nibbled at fruiting mushrooms if they could get close enough. For this reason, he created about a three-foot boundary between the mushroom logs and the duck fence, making what he called a “slug-free moat.” The ducks were close enough to munch on slugs but not mushrooms. The second year of research brought a humid and rainy season, ideal conditions for slugs. The weather allowed Gabriel to collect more information about the effect of ducks on reducing slug pressure. From data collected in the first season into the summer of the second, he said he can “suggestively say ducks are effective” at reducing slug populations. He monitored slug damage based on mushroom weight and appearance at harvest. Although the main purpose of his research was evaluating ducks as a slug control measure in shiitake production, it was important to Gabriel that the ducks be a viable source of income and a productive piece of the already existing agroforestry system. Many things Gabriel observed in the first year of research were practically applied in changes to experiment design in the second year. 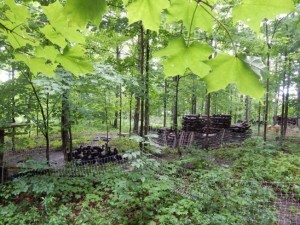 For example, ducks were not rotated around the forest during the first year and visibly decimated the forage understory as a result, indicating to Gabriel the need for a rotational land use system. In 2013, Gabriel refurbished the materials from the first season’s duck house to make two smaller, mobile ones and invested in light, portable fencing. Ducks were rotated weekly either to a quarter-acre plot of fresh forage in the woods or to pasture, where they remained for a week before being packed up and moved again. It took 1-2 hours to move the ducks in their coops, which are built on travel trailers to ease the process. Gabriel said he is getting faster at duck moving with every passing week. In the first year, having the end goal of slaughtering the ducks and selling them for meat to local restaurants, Gabriel spent a lot of money on grain feed. He found himself more worried about the unpredictability of grain prices than factors more under his control. Finding a way to encourage foraging seemed a good solution to the feed issue. In 2013, birds were fed only once a day to increase foraging tendencies. In the first year of research, another concern was the sustainability of a system in which off-farm ducklings had to be introduced each season. A flock of Cayuga mallards. “Our plan is to move away from buying from a big hatchery,” he said. By keeping about 20 birds at the end of this season, he will be able to avoid ordering from the hatchery by beginning to breed and raise his own ducklings on-farm. All these changes in strategy added up to a shift in overall production focus. Ducks raised for egg production do not need to be as voluminously fed grain as meat ducks and can be valued more for their ecosystem services, such as slug control, than their market value. In 2013, Gabriel planned to sell eggs and breeding pairs locally at a much lower cost of production than the meat birds raised in 2012. One of the reasons for the success of Gabriel’s agroforestry system thus far is his ability to quickly apply new knowledge. Over the course of the first season of research, Gabriel learned a great deal about the disposition of the breeds chosen. For example, he decided against raising Muscovy ducks again in 2013 after observing their tendency to prevent co-habiting Rouen ducks from reaching the feeder. This was also reason to separate the duck species into their own test plots in 2013. One breed emerged as his favorite, the Cayuga, the only North American domesticated duck. These sleek-looking, jet-black birds are great for laying and good for meat production as well. “It’s all about finding what works for you,” Gabriel commented on the several major shifts in strategy made from 2012 to 2013. His continued research focus is to work on raising ducks for laying and breeding with particular attention to ducks’ effect on soil and forage quality. SARE offers sustainable agriculture grants, bulletins, books, an online events calendar and many other resources. Learn more about the Northeast SARE program by visiting www.nesare.org or by contacting Northeast SARE at 655 Spear Street University of Vermont, Burlington VT 05405. Looking to the future, Gabriel wants to find more effective ways to water his duck flock. He has found that ducks consume twice as much water as chickens, and ducks’ long bills dirty their water supply quickly. His current rainwater catchment takes a few hours of rain to supply about 40 gallons of water, enough to water the ducks for one or two hot days. He has plans for the construction of a small pond that could improve water efficiency. Gabriel’s advice for others was to “start simple” and recognize the increasing complexity of a growing agroforestry system. Learn more about SARE Project Number FNE12-745 at http://mysare.sare.org/mySARE/ProjectReport.aspx?do=viewProj&pn=FNE12-745. Steve Gabriel is owner of Works With Nature, LLC. His farm is located in Trumansburg, NY. He can be reached at steve@agroforestrysolutions.com or 607-342-2825. View his Agroforestry Solutions blog at http://agroforestrysolutions.blogspot.com/. Abigail Woughter is an undergraduate Agricultural Sciences major and served as the Cornell Small Farms Program summer intern in 2013.